We’re starting 2019 strong with a KeyForge Tournament on each 2nd and 4th Saturday of the season! Enter a world where anything is possible! Take command of a one-of-a-kind Archon deck and race against your friends to open one of the Crucible’s hidden vaults. 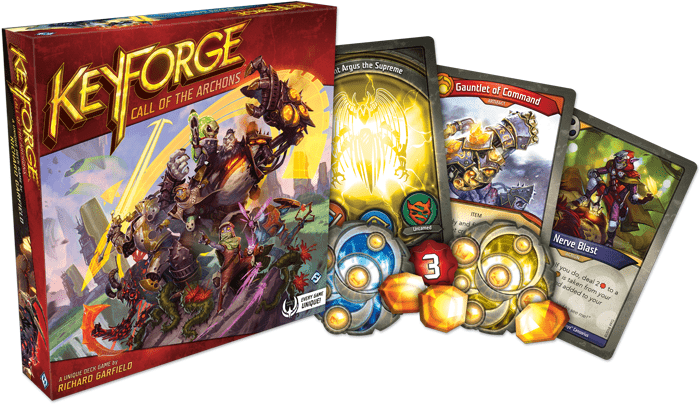 KeyForge: Call of the Archons is the first ever “unique card game” where every deck that will ever be purchased or played will be different than any other. It is a game about how well you can manipulate your deck’s combinations and pilot it to victory. Tournament cost will be a $5 entry fee, or purchase a new deck for $10. Bring your deck, or purchase a new one! Every deck has been generated to be unique yet balanced. Winner of the tournament will get a gift card to the store, and they will also receive some cool metal key tokens provided by Fantasy Flight! All participants will get a house themed chained tracker card (while supplies last). We also have some KeyForge lanyards. Don’t know how to play? No problem! We have a couple of demo decks that we can teach you with! Learn to play, before the tournament and purchase a deck, and you’re welcome to join in the tournament! Please bring your own tokens to play with, we only have a small supply available, and Fantasy Flight is against us using dice as counters. You can use whatever you want as tokens as long as it is clearly readable for other players to tell the game-state. Opaque sleeves are required for the tournament. We will do our best to keep enough available for purchase before the event.